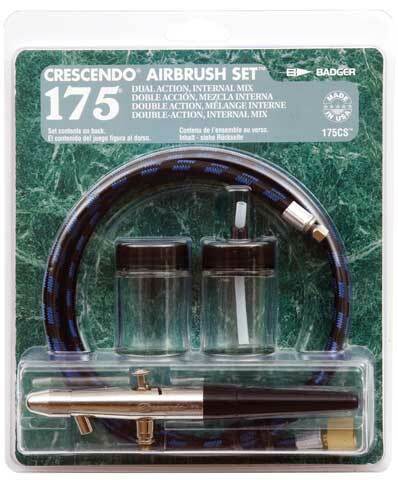 This set features a dual-action, internal-mix, siphon-feed (bottom-feed) airbrush designed by professionals for professional production airbrushing. This durable, versatile airbrush works continuously with precision and efficiency. The self-lubricating PTFE needle bearing enables continuous proper paint flow. Spray regulators and tips change easily for great flexibility. It has a winged back lever design for easy reassembly and smooth trigger control. The 1-piece, non-slip, trigger has and ergo-comfort trigger cushion. The snap-off handle allows for quick needle changes and cleaning. Great for T-Shirt artists, fine artists, fabric designers, custom automotive painters, model painters, taxidermists and more. It sprays properly reduced acrylics, enamels, lacquers, gouaches, fabric colors, inks, dyes, ceramic colors and glazes, watercolors and more. The set also includes two empty bottles and an air hose.